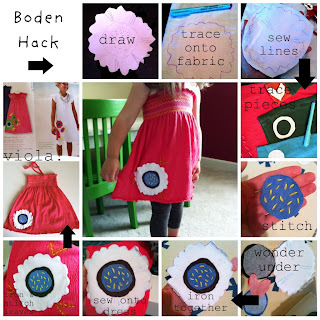 I've spent my fair share of money on mini Boden stuff. I felt that I earned this one. Saw this dress, loved it, and figured I could recreate a version of it for a lot less than $54. Buy a dress. I got mine at Target for $9.99. It shrunk a ton, so size up! Draw your flower. I was in a hurry, so I only did one. Trace onto fabric. (The purple pen disappears.) I used old shirts from around the house. Cut flower and sew lines. They look like whiskers. Trace all other pieces onto fabric. Iron pieces onto Wonder Under. Iron and stitch leaves on. Not an exact match, just a quickie version. Again, the dress was $10 and it took me about an hour. I might just make another one! I think you were entitled too. Darling. Really. I thought it was perfection. :) Thanks for linking up to Motivated Monday at BeColorful and I hope you will visit again. that's so darling! i love my little boy, but sometimes wish i had a girl also to dress with cute dresses like this! 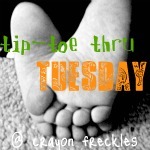 thanks for linking this up to my tip-toe thru tuesday party!